Another great day's work in the Cottage Garden as I got our intern and one trainee to help too. 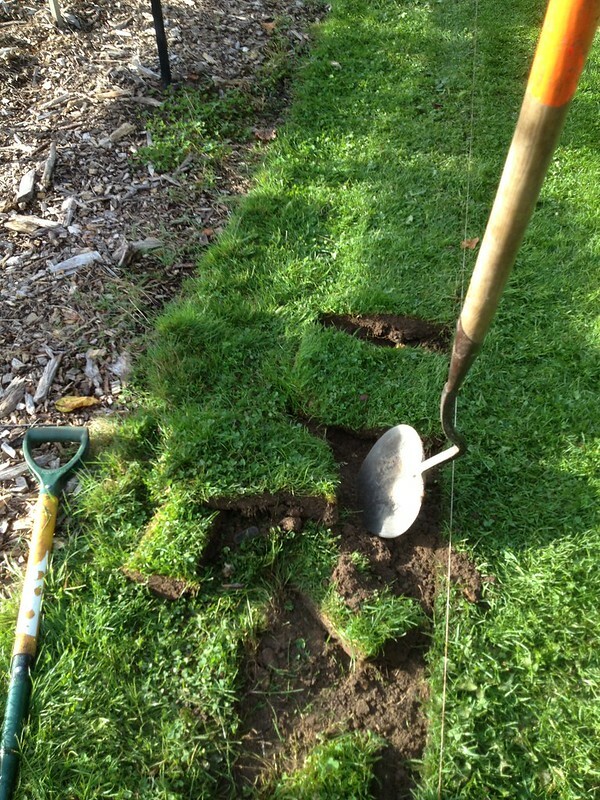 My proposal for a new path was accepted, so I marked it out with bamboo canes and string and we dug in (literally) first thing in the morning. By teabreak time, we had already finished the outline. 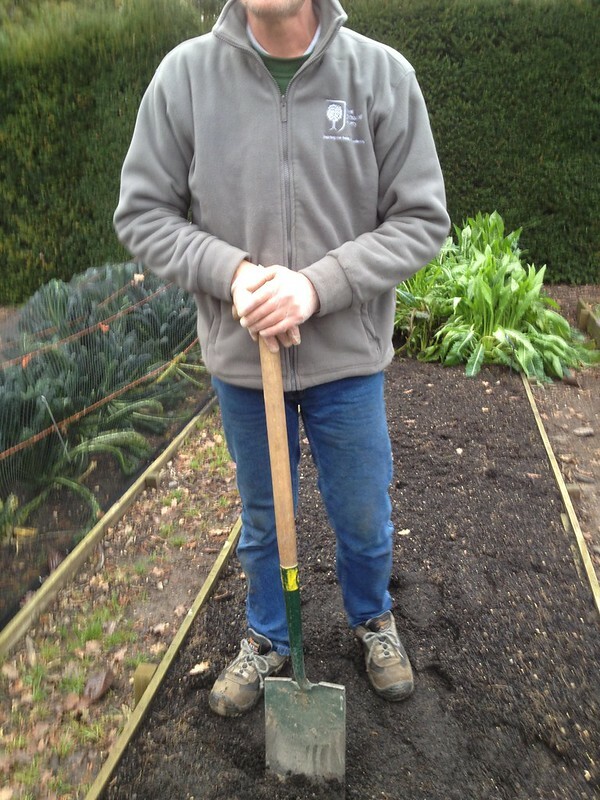 We had then to spread the extra soil, which was very useful to raise the ground level where a tree had been planted too high, and to fill in some dips here and there. Some plants were in the way of the path, namely a couple of Agapanthus and 3 of the 4 blackcurrant (Ribes nigrum) shrubs in the area, so we had to move them. It is not ideal time to move Agapanthus as they are tender perennials and they'd rather be left alone over winter and only moved in spring, but we decided to go ahead anyway as the plants, should they die, are easily replaced - that might not always be the case, hence careful early planning might be needed. 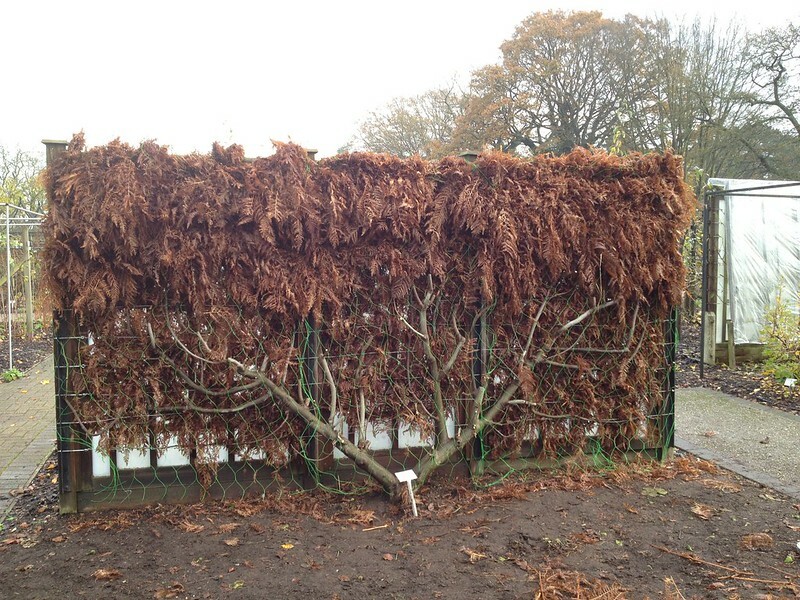 Sometimes trees are root-pruned one year in advance of moving them after a year, so that they have enough time to put up new growth of fine roots (which will enable better establishment) before the operation takes place. 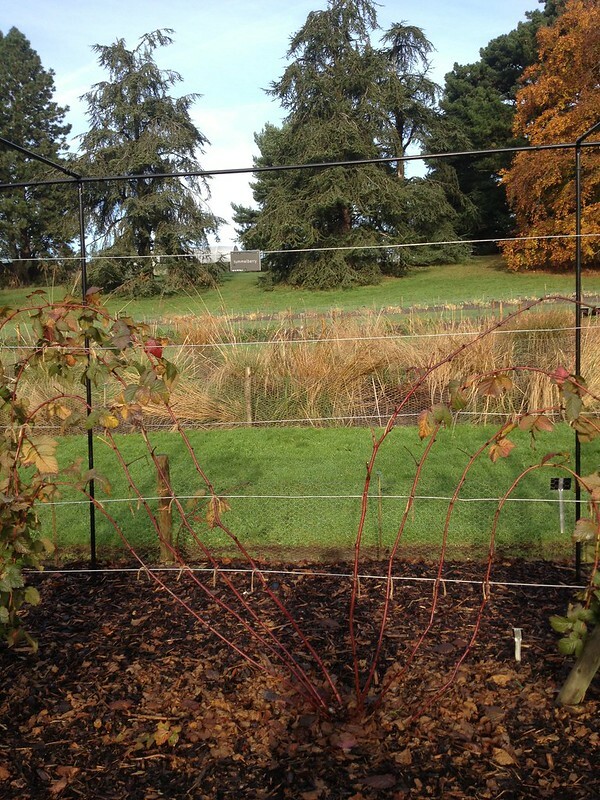 It was good enough time to move the blackcurrants, though, even if the season has been exceptionally mild and they are not fully dormant yet. I love blackcurrants with their unassuming but prettiest of flowers, delicious and nutritious berries and, most of all, fragrant foliage that releases on the lightest brushing against the plants. 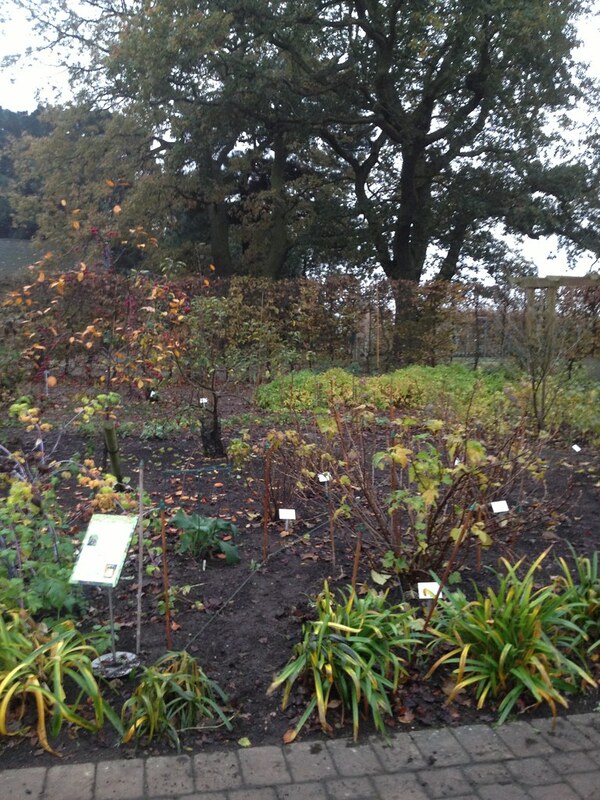 Because of that, we have now replanted them alongside the paths, so that visitors can enjoy them close-up. After a good tidy up, we could take some pictures of the result: I loved it and was so thankful to my colleagues that made it possible so quickly. As I had taken a panorama picture from the same spot on the main path one month and a half ago, I can now make a comparison of the wider view. There is now closer access to the blackberries, the chuckleberries (a cross of redcurrant, gooseberry and jostaberry ), the two Malus that flank the path on one side and the Asimina triloba (or pawpaw, a rather interesting tree too) on the other. 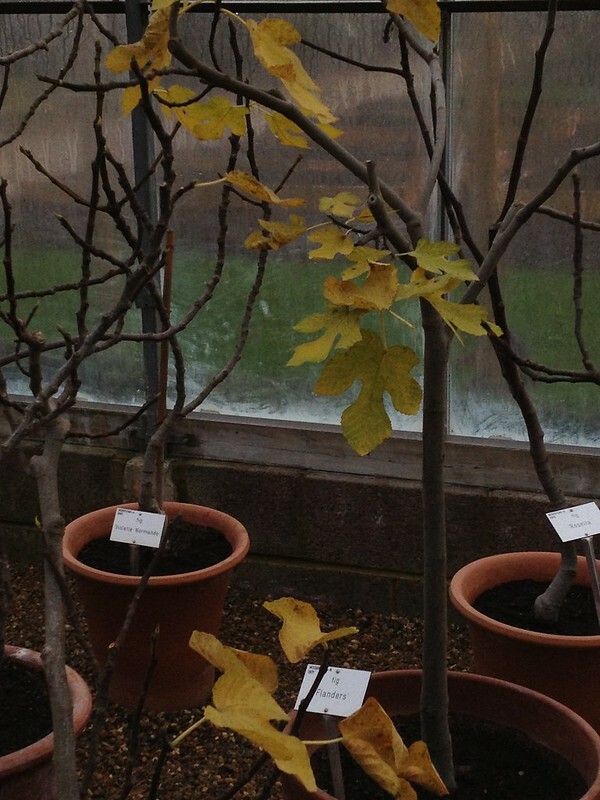 The preparations for winter continue, and today it was the Model Fruit Garden fan-trained fig's turn to be put to sleep. 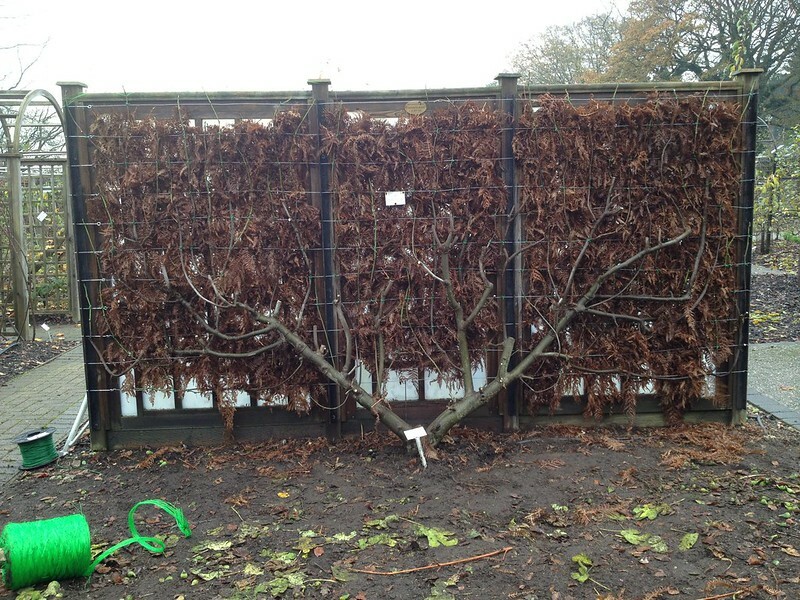 The first step was pruning the tree, untying it from the frame. 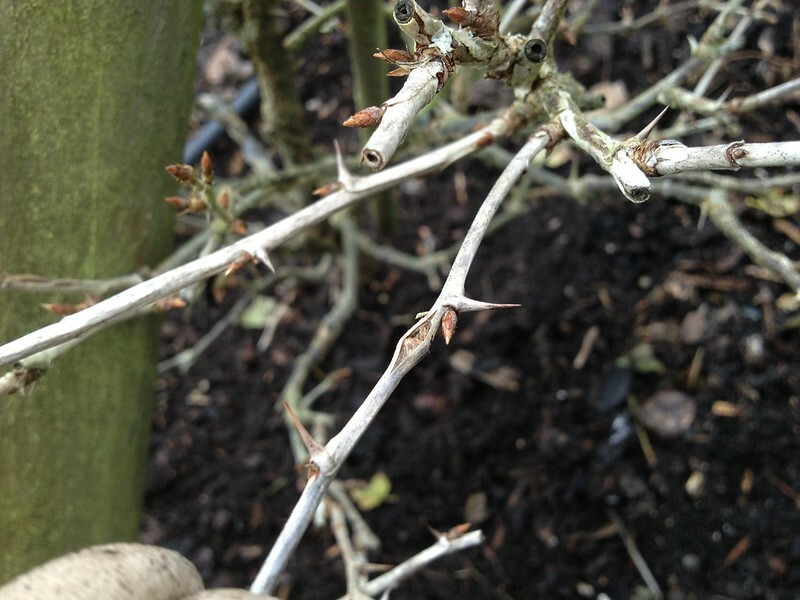 axils at the tip of new branches, so it is necessary constantly to generate new material through replacement pruning. 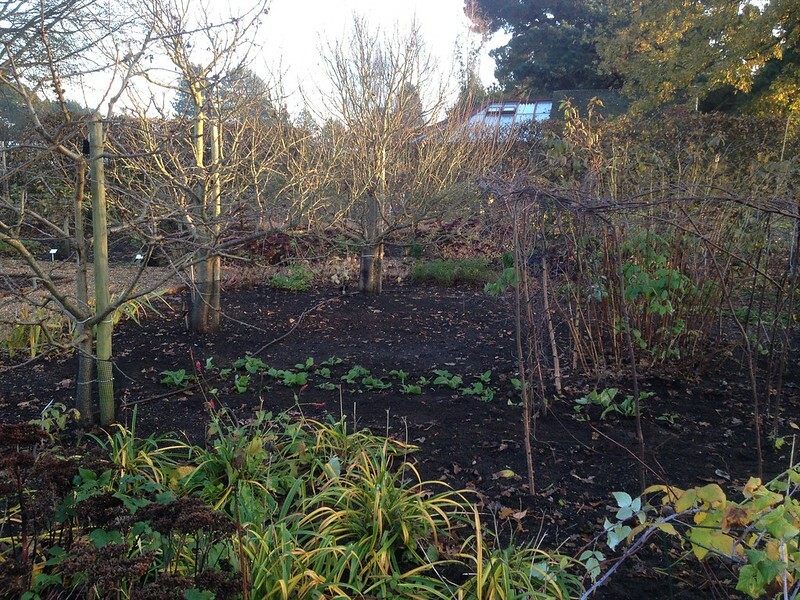 cuts) where leaving snags after pruning is not frowned upon for plant's health reasons. To preserve the shape of the fan, and keep branches to an appropriate distance of some 10 cm, one also has to cut some branches back to their origin, but one has to make sure to preserve enough branch tips to get fruiting the following summer. 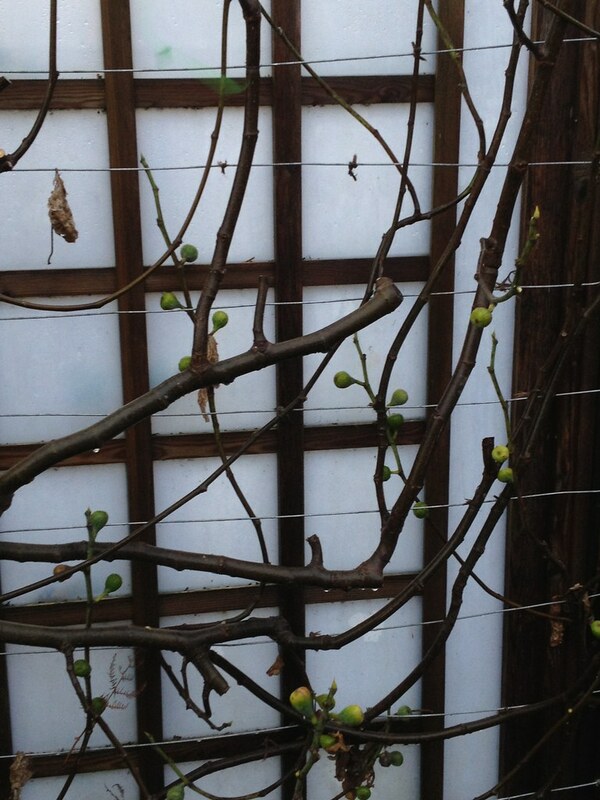 The pruning regime for trained figs also consisted of pinching back new shoots to 5 leaves before the end of June, so they produce shorter sideshoots, that have time to ripen before the frosts. The fig is planted in a concrete pipe section to restrict growth and improve fruiting (one could use concrete slabs, as I do at home), but roots have a habit to run out on the surface and away, so we did some root pruning too to bring them back. As figs layer quite easily, the lowest branches also needed pulling outof the ground and pruning back where they had rooted. 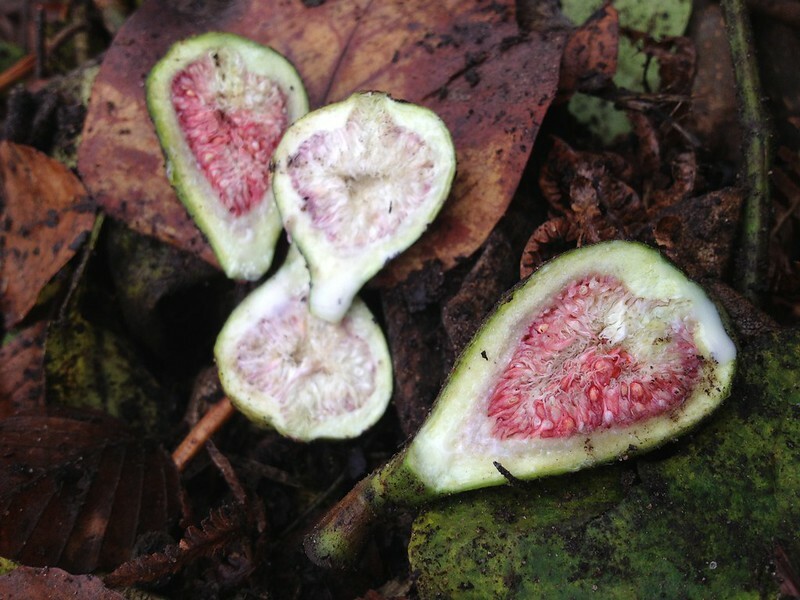 Figs are hardy plants, when the wood is completely mature, but in the UK it is best to give them protection so as not to risk losing branch tips that are still not completely ripe. So the next step was to cover the tree with bracken, a material that does not soak in water, so helps keep the plant dry as well as warm - it comes with a minor health risk, though, as bracken spores (relased mostly on hot dry days in late summer) may be carcinogenic if inhaled, so one might want to wear a face mask if doing this often. 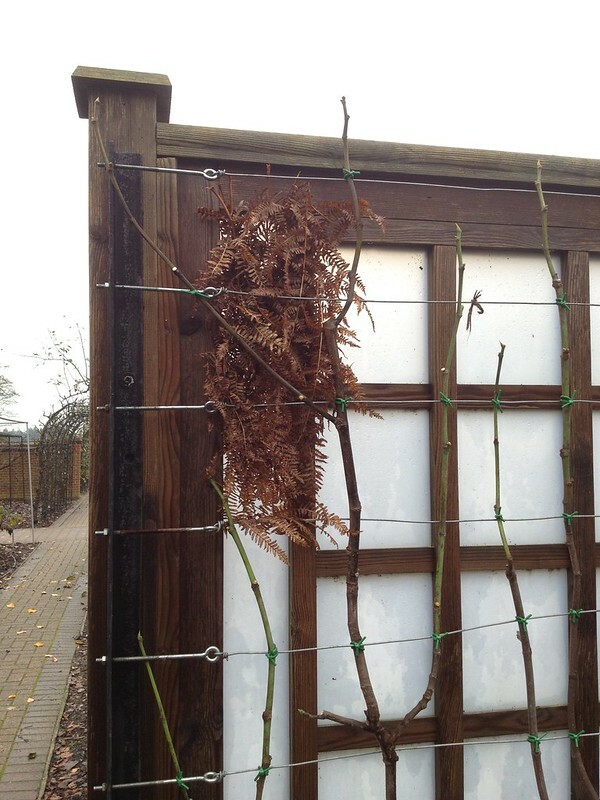 We train our fig against a screen, so we put bracken between the tree and the frame, and then secured some netting along the whole widtht and height in front of the tree and stuffed bracken in between there too. 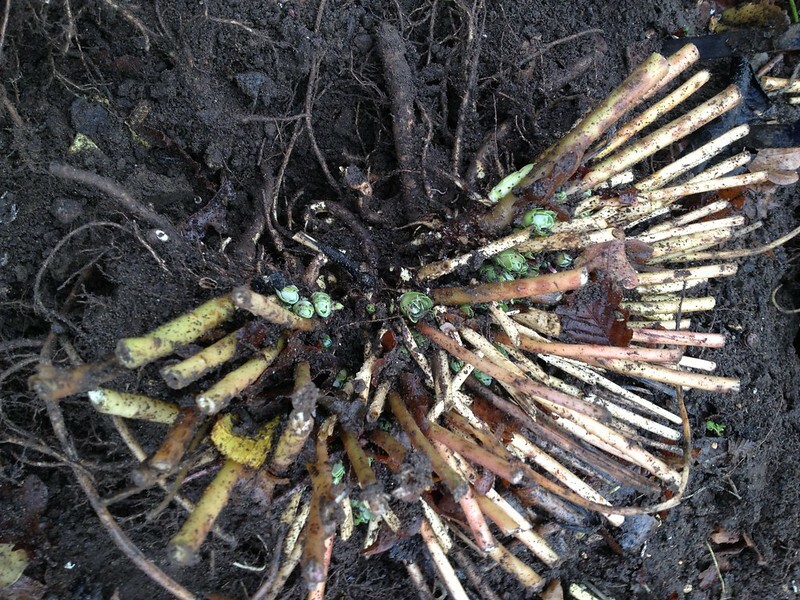 There is a best way to stuff bracken by pulling leaflets from the stems (that will be discarded), bunching them up all in the same direction (fronds down) and using them like that, nice and tidy. The reason is so that you can take it out without too much effort in the spring... if you get to take it out, that is! This year we could not do it in spring because a robin nested cosily into it, and we had to wait for the fledglings to leave the nest. 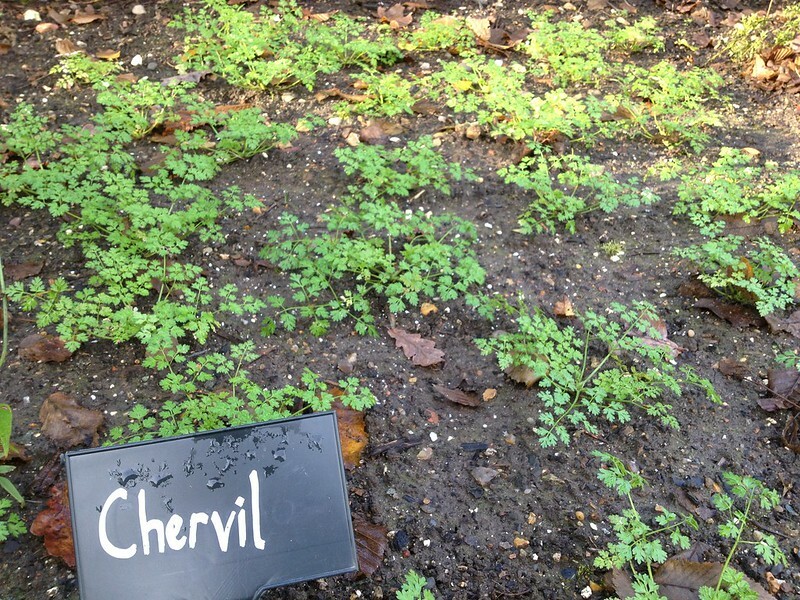 cover in the greenhouse: they need free draining compost but regular watering and feeding, because in their natural dry habitat they spread far and wide to look for their nutrients. I am fascinated by stories, and the one that caught my attention most today was one about there being volunteer figs around the country, outside bigger towns, on riverbanks, dating back to Victorian England. Apparently, dried figs were a popular festive food and they came seeded - the seed ended up in the sewers and were discharged in the rivers, where they germinated in the warmer microclimate. Pollination and seed formation in figs is a very complex thing, for one the flower are enclosed in the syconium, so they are not easily accessed. 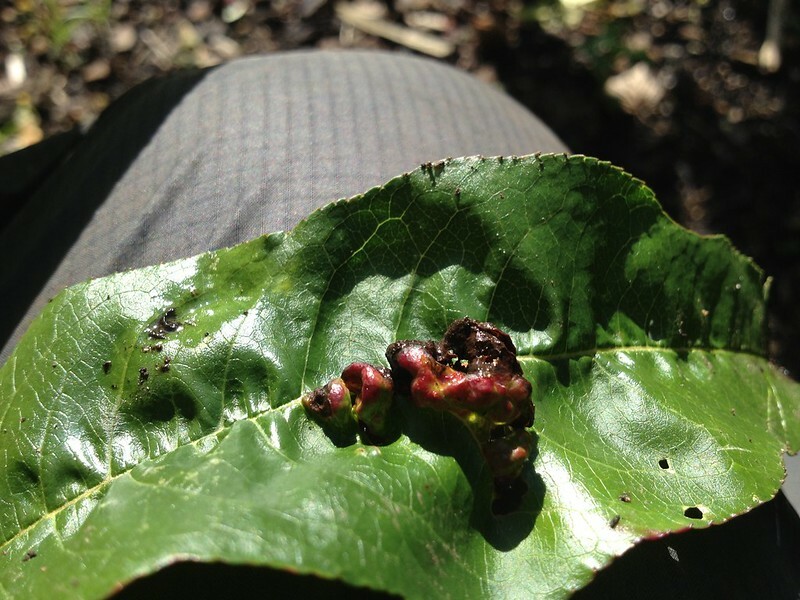 But tiny - 1mm - wasps have co-evolved with the plant in its natural environment to enter through the fig's ostiole (the opening opposite the peduncle) and pollinate it while using the syconium as a breeding pod. That's amazing and if you want to read more about it I found some great sources. But what I have not been able to check out is the statement that only figs from their native environments contain (viable) seeds because there are no suitable wasps in the UK. 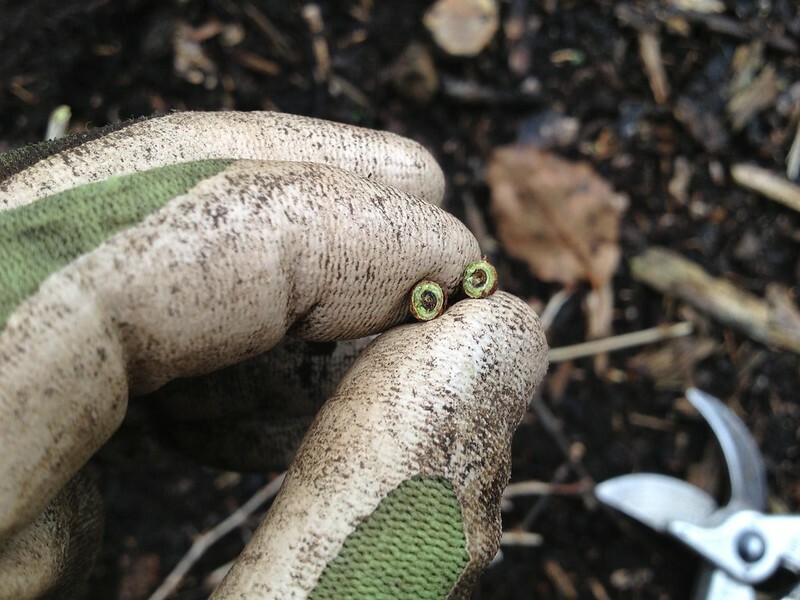 I sliced open one of the figs we removed from the tree while working on it, and I can see what look like seeds. Are they? 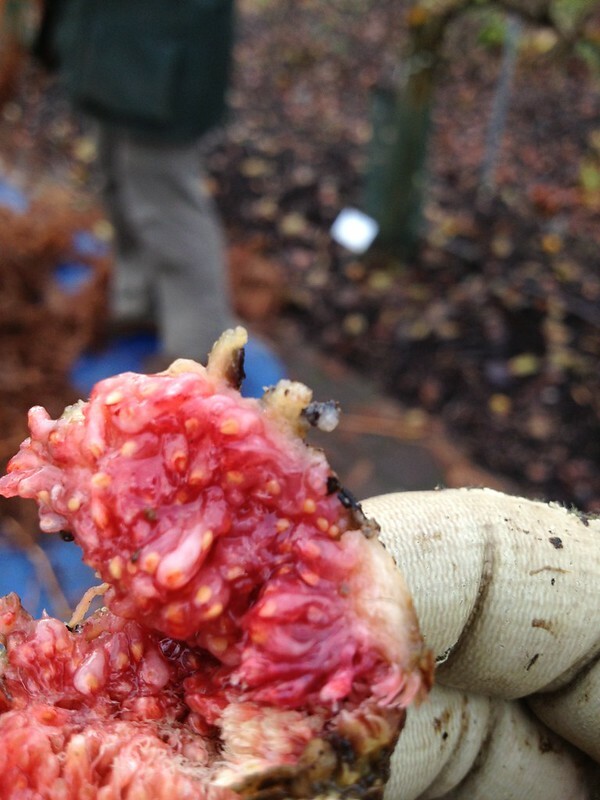 Some of the fig cultivars we grow in the UK are parthenocarpic: does that mean they produce no seed or unviable seed? Youngberry, with round fruits and fewer seeds, this cross of loganberry and dewberry has never gained much popularity. Canes come in three main types (trailing, semi-erect, erect), which require slightly different management, but in common to all is the fact that one needs to keep primocanes (vegetatively growing canes, in the first year) separate from floricanes (fruiting canes, second year - and sometimes short-lived perennials), so that they are not shading ripening berries and are in the way of picking ripe ones. 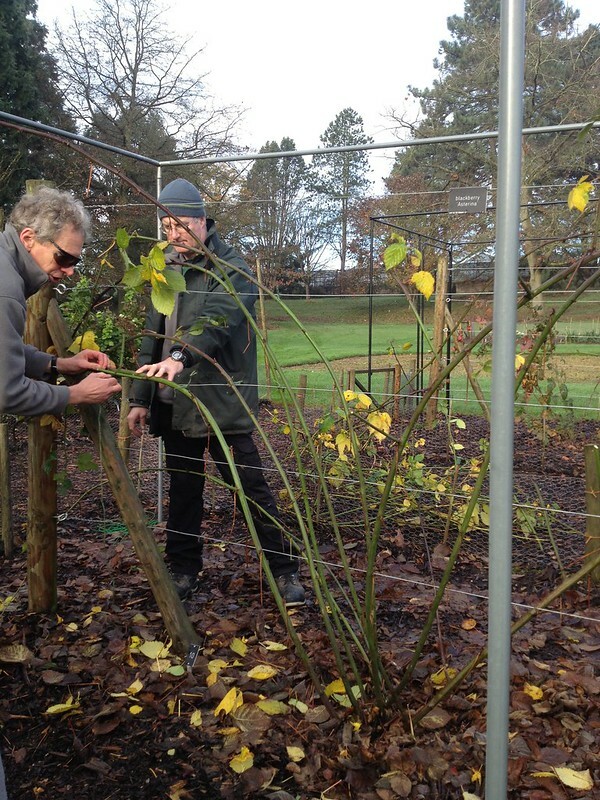 At RHS Garden Wisley some of those berries are being trialled, on a post and wire system, and we had the opportunity to work with them. They are planted at 3 m apart (you could however use less for less vigorous and more for the bigger ones) and trained as a two-way rope system to 6 or so floricanes per side, set 15-20 cm apart on the three lowest wires, while the topmost one is kept free for new, primocanes to be tied in. 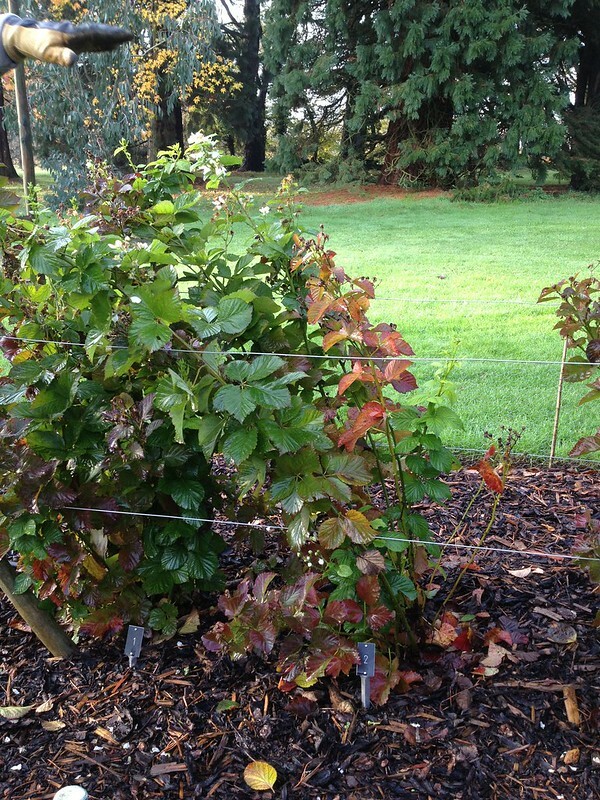 Plants are lined up in order of ripening, for easier picking and management. as they grow, primocanes are kept tidy with the use of strings, tied in the middle. in the autumn, primocanes are laid out to replace the fruited floricanes on the lower wires, tied in the first instance with knots in the figure of 8 (knot away from the branch), on the side of the prevailing wind, trying to get them in the direction they want to go. 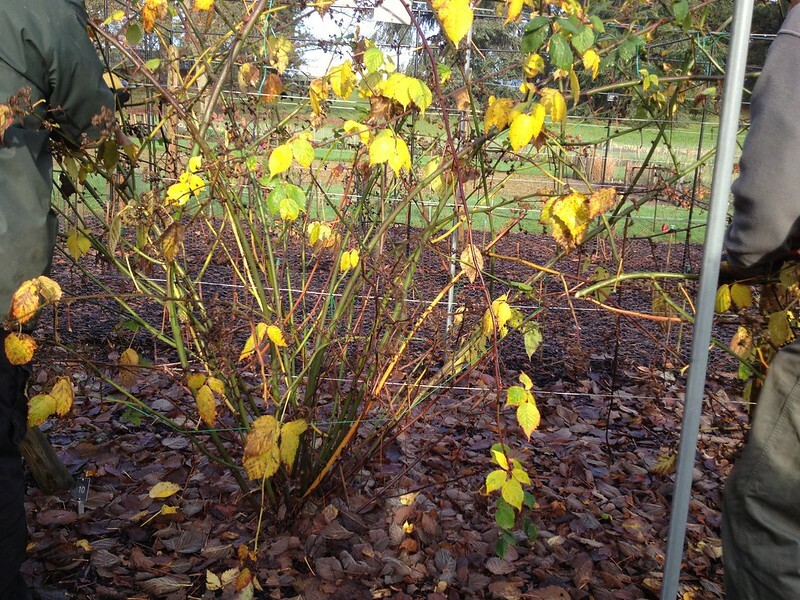 Short laterals are shortened to 3 buds (longer ones may be kept entire). 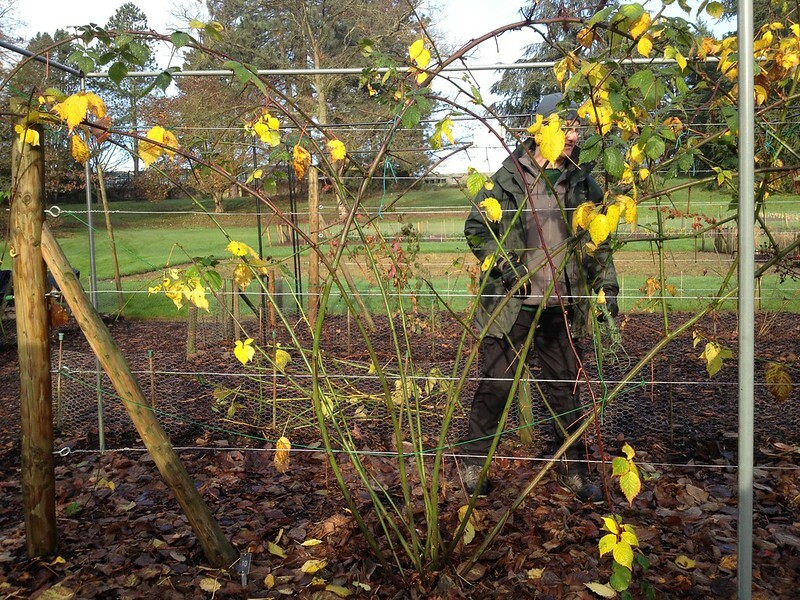 When the branches are all satisfactorily laid out, 15-20 cm from each other and evenly space on both sides, they are laced in, as it's done with raspberries. 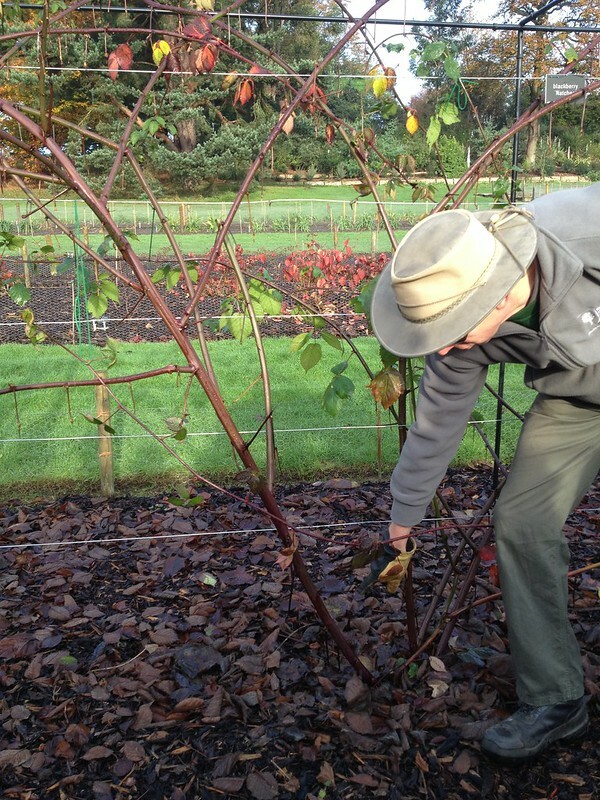 As part of the trials, we were shown some primocane-fruiting blackberries that were bred in Arkansas, USA, which flower and fruit on top of the canes in their first year, and are therefore managed like autumn-fruiting raspberries, pruned in February and trained in between parallel wires. They should be quite easy to pick, however, fruits do not seem to be quite ripening in the short English summers, so more breeding will be needed before gardeners in the UK can make productive use of such new cultivars. 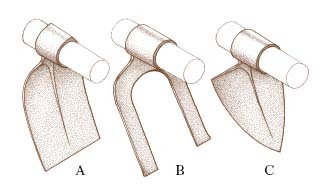 HDC released a cane management brochure, which has convenient diagrams for all the various support systems, and tying in and lacing techniques. ... as over the last couple of months I have had several stints at pruning the cordon collection, and there are still a few to go. 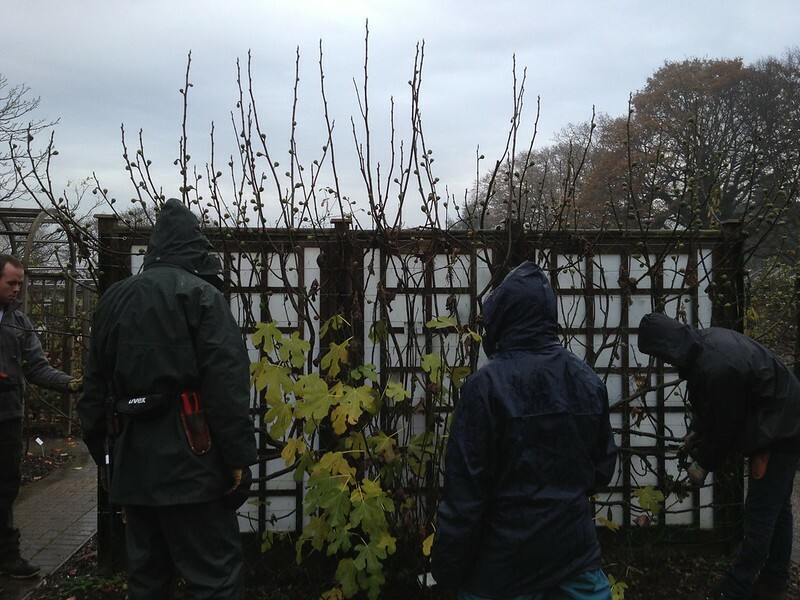 Cordon gooseberry pruning is, as of now, the only skill that I feel I really had time to practice long enough to master. 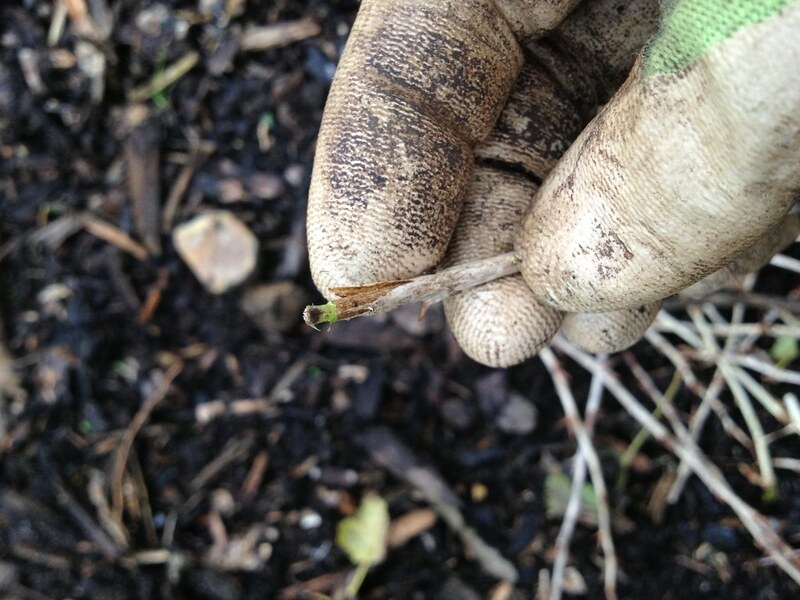 I have also tried to time myself to see if I was getting any faster, clocking up 17 plants in 3/4 on a day earlier in the month, then 10 in 1/4 of a day, then 25 in a day but because the plants were all different sizes, and in some instances we shared plants between us, that was not a particularly useful exercise. But now that they are largely done, what I am really interested now is to see how these plants will fare in the summer, how they will flower and fruit: whether the size of the fruits really makes this system worth the effort. Because these rows of plants so close together (30-45 cm between plants and about 1 m between rows) and pruned so hard all the time (lateral to 5 leaves in the summer and to 2 buds in winter), while supposedly producing bigger fruit, they need to be replaced more frequently. As a matter of fact, like a lot of the intensively grown gooseberries, they are affected by dieback (which I found out are caused not only by mildew - as mentioned in my previous entry - but also by a range of other air- and soil-borne pathogens, among which Eutypa fungus which also affects grapevines) and we have to be very careful when pruning to disinfect the tools between each plant with Propellar disinfectant. Wounds and stress cracks from tying to wires are likely to be the main entrance points of disease, according to the HDC study of gooseberry dieback, so pruning earlier in the season when wounds heal faster, and in dry weather when fewer spores are around, as well as good pruning (without fraying cuts or leaving snags) seem so far the best prevention strategy. 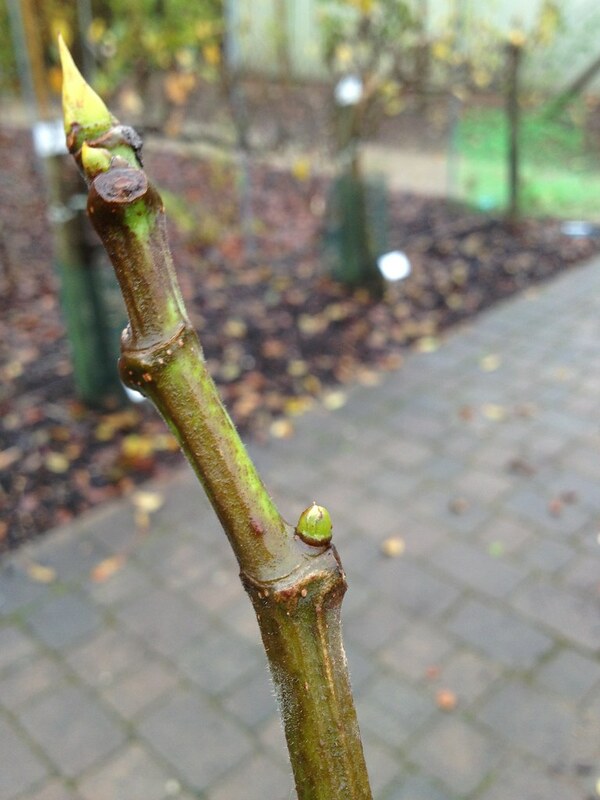 While pruning this time I also found swellings above some of the buds, which I'd like to investigate further as my colleague had not seen them before, as she is also relatively new to managing the collection. 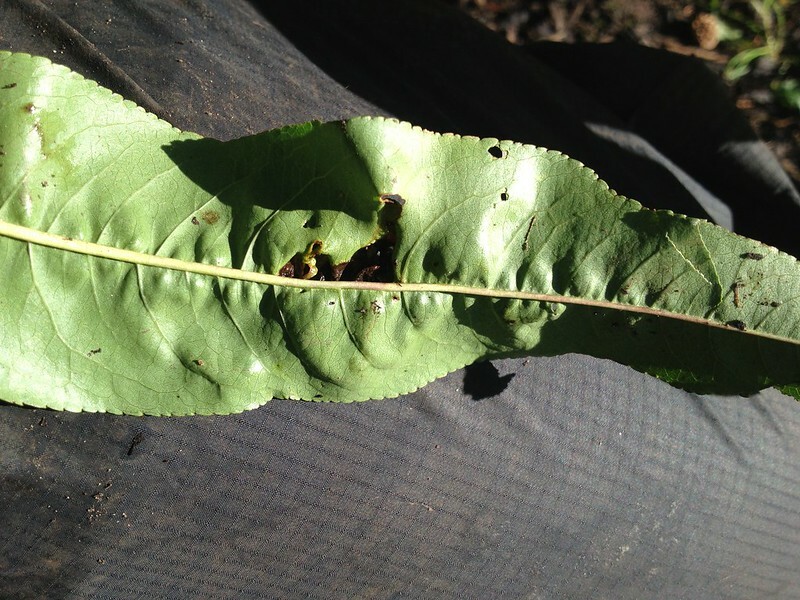 When sliced through, they show a healthy phloem around a swelling of the xylem, with localised brown discolouration. The collection is being renewed and moved to a new site to try and improve its vigour, and I will be probably be able to take part in part of the renovation before I leave the Garden, which is quite exciting, really. And for a change from just pruning, I have also helped propagate some of the cuttings we took for the purpose. The ones we had cut off last month had been heeled in in a pot, as we did not have time to deal with them straight away. When we went to fetch them we were rather surprised to find some of them had callused, or even already rooted quite well, thanks to the mild weather: very promising indeed (although we were told that sometimes you need to scratch away callus, as it prevents proper rooting in some cuttings, but it should not be the case with gooseberry)! 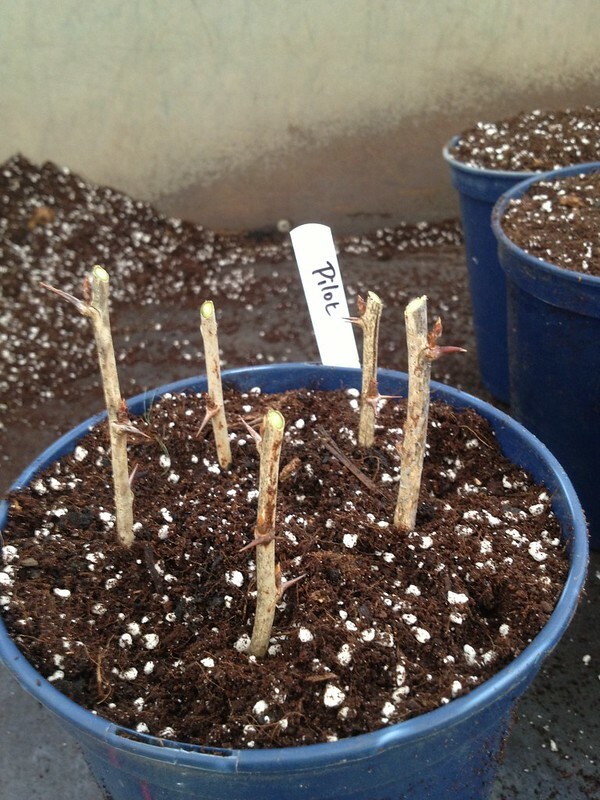 We used the propagation facilities to pot them properly. 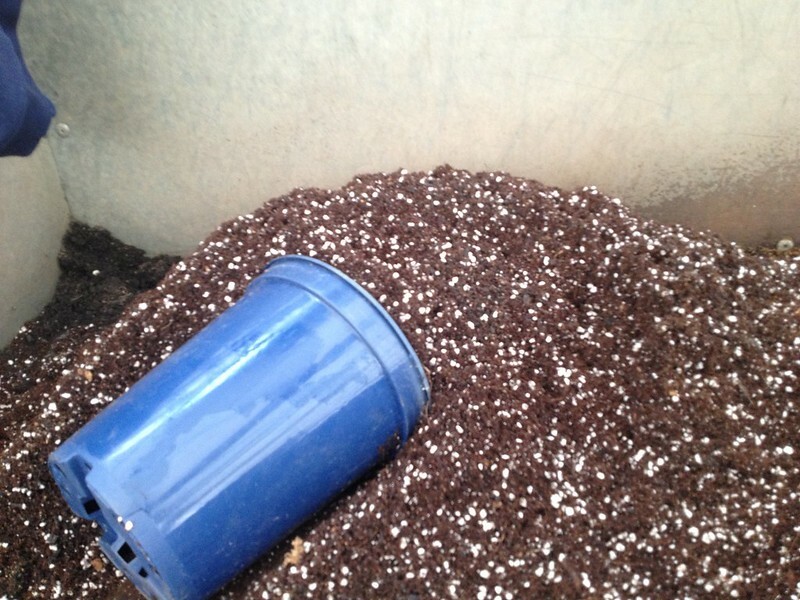 Light compost (pre-prepared coir mix with added perlite) was scooped up in the pots and levelled with a brief shake and tap on the bench, so as not to compact it. ... and off were they wisked into the magic world of the propagation houses, where they will be taken care of so their chances of taking and thriving are maximised. 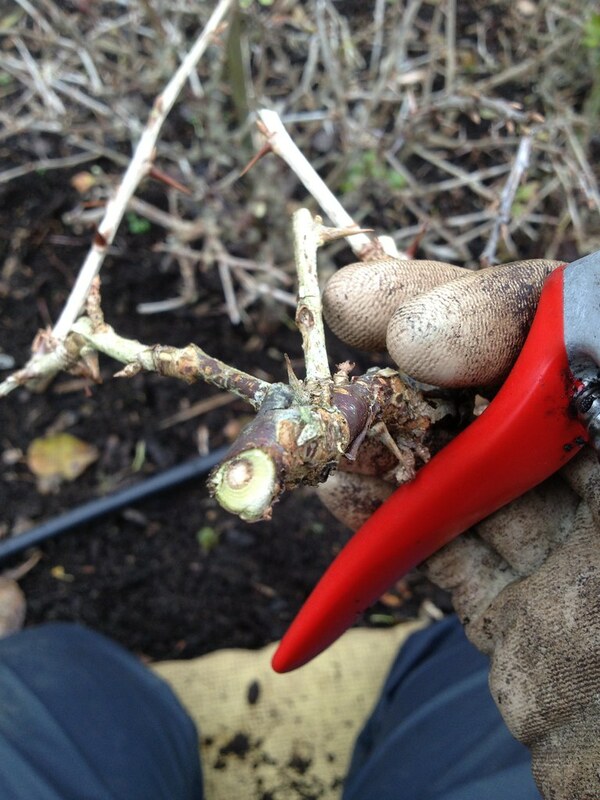 We did not remove any buds from the lower part of the cutting (which is done to avoid suckering and grow the bush on a leg) to help maximise rooting and minimise wounding to the cuttings. 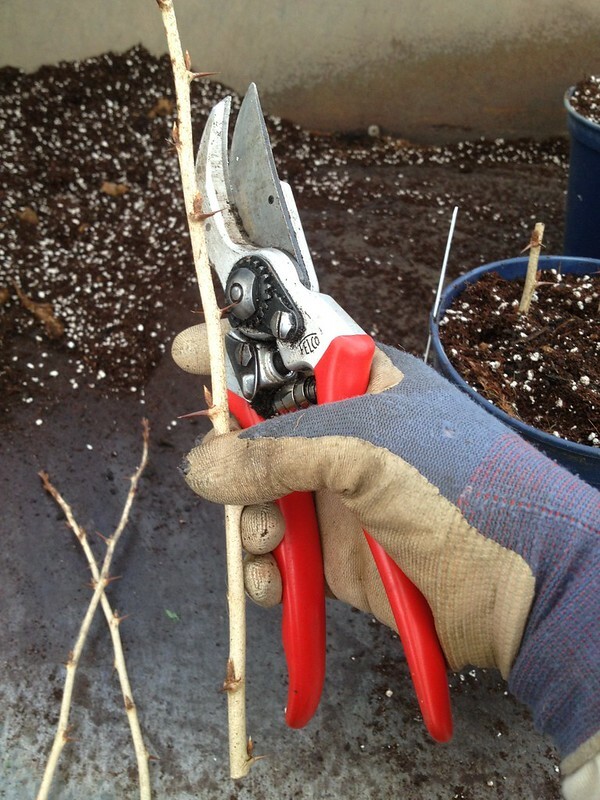 Once the cuttings are rooted, if you want to grow your shrubs on a leg (which is what we do with cordons, and which produces bigger fruits), you will disbud some 15-20 cm of the lower stem, keeping only 4 or 5 buds, which you will use for the framework of your shrub. 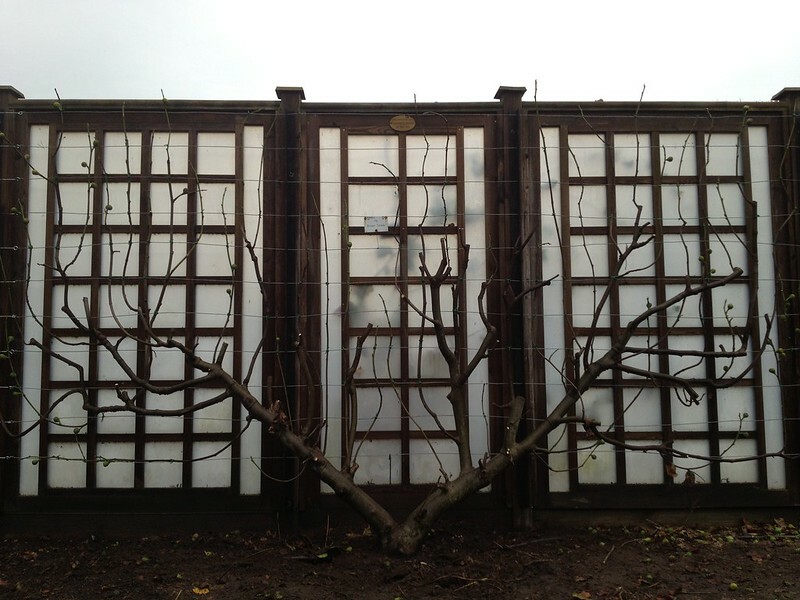 If you grow them as cordons, you encourage the leader to grow, up to the topmost wire, by cutting it to half its size, still encouraging upright growth, while keeping the other branches short (2 buds in winter). 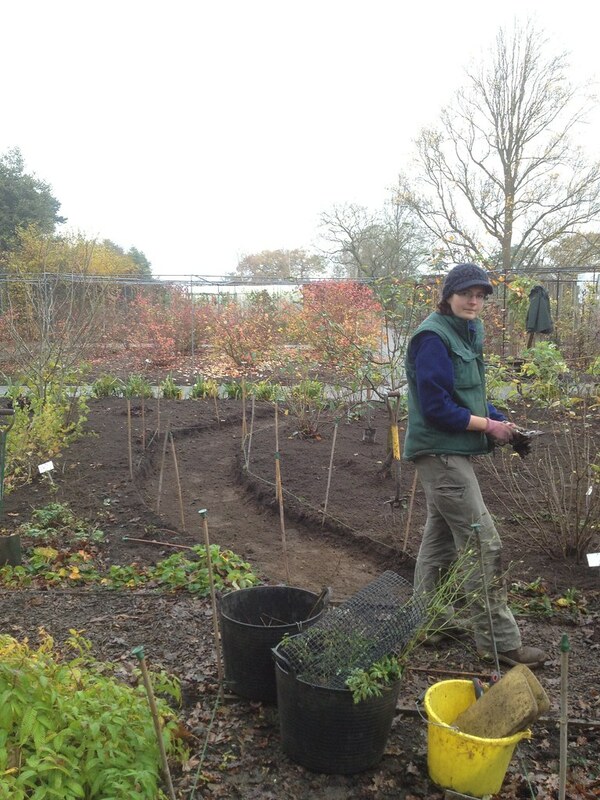 If you grow them as shrubs on a leg, you keep a framework of four of five outward and upward growing branches, treating them all as different leaders (shortening them to half as you develop the framework) - we grow shrubs as if every framework branch was a cordon of its own in the Garden. 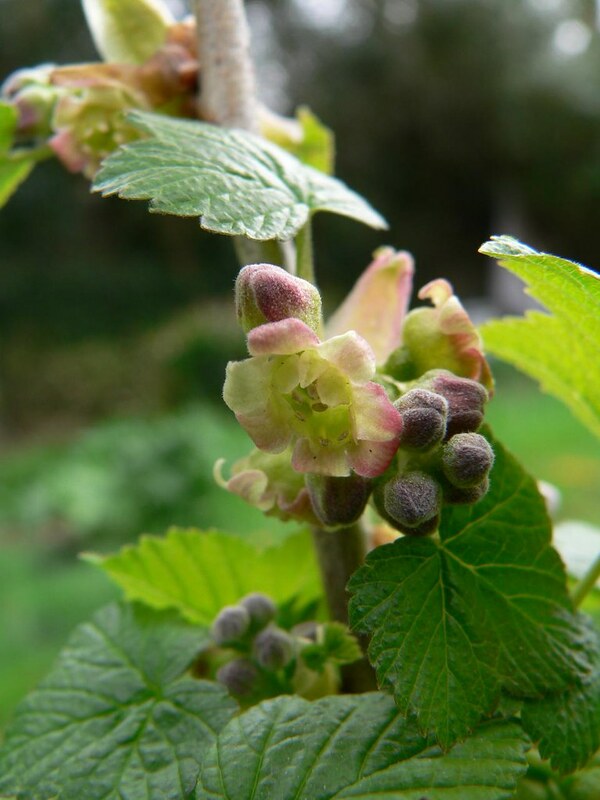 You can also grow your gooseberries as stools, by encouraging growth from the base and regularly renewing the structure: the fruits will be smaller, but the plants longer-lived. I found this leaflet provides useful propagation guidance. 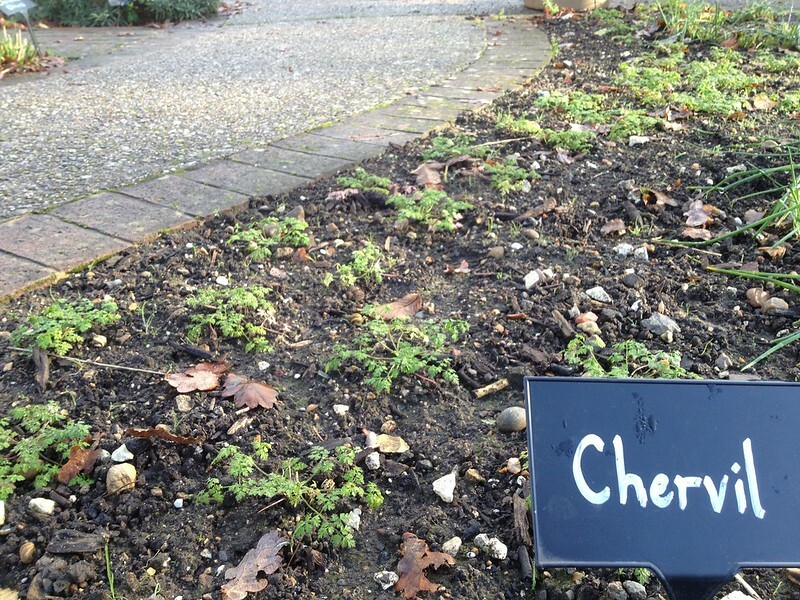 It is late indeed as the season has been so mild, but the time has come to puts plants to rest for winter while cheering the place up with some winter bedding. 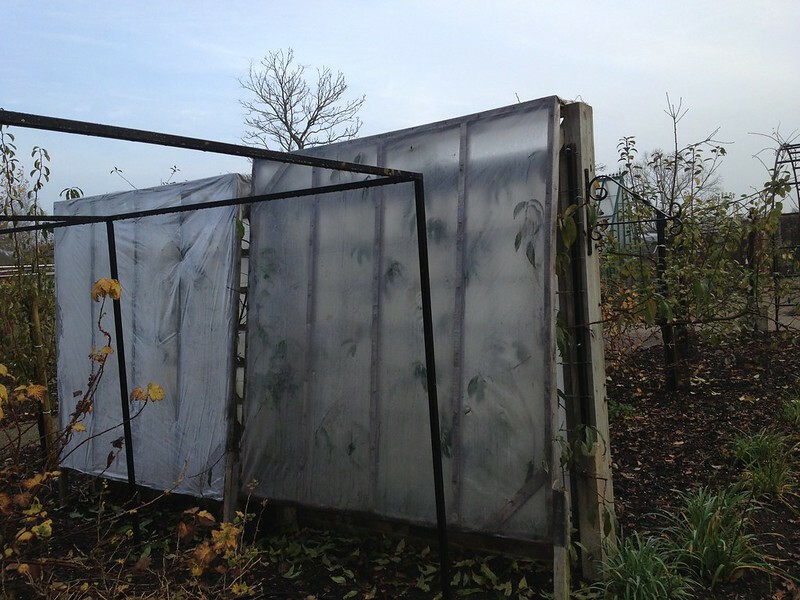 Today we put up the lean-to frames, made of wood battens and clear plastic sheeting, to cover the fan-trained peaches and apricots and keep them dry to prevent peach leaf curl (Taphrina deformans), a fungal disease that may weaken the plants and infection from which is promped by wet conditions in spring. There is a very convenient leaflet with instructions on how to make lean-to frames, like the ones we put up today, on the RHS website. 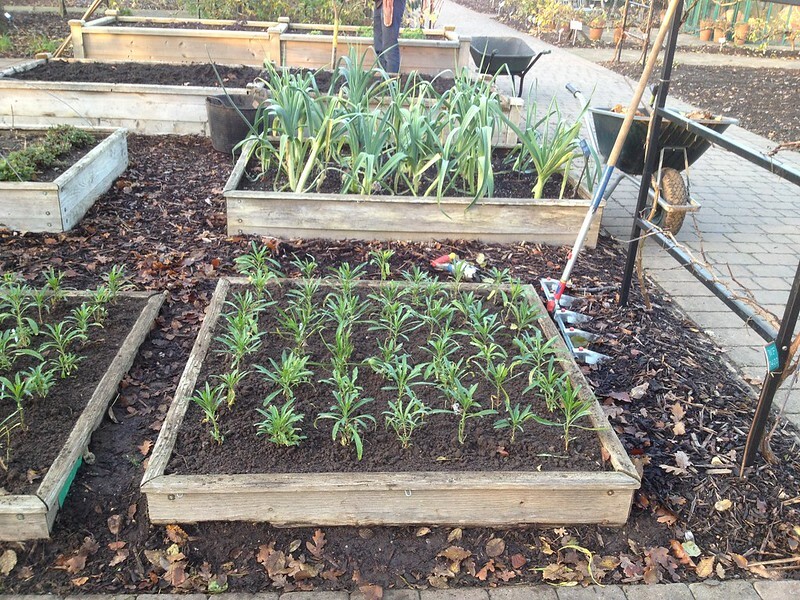 After that, I learnt the use of a new tool as we filled some empty raised beds with wallflowers (Erysimum) that will overwinter and flower for some early cheer. 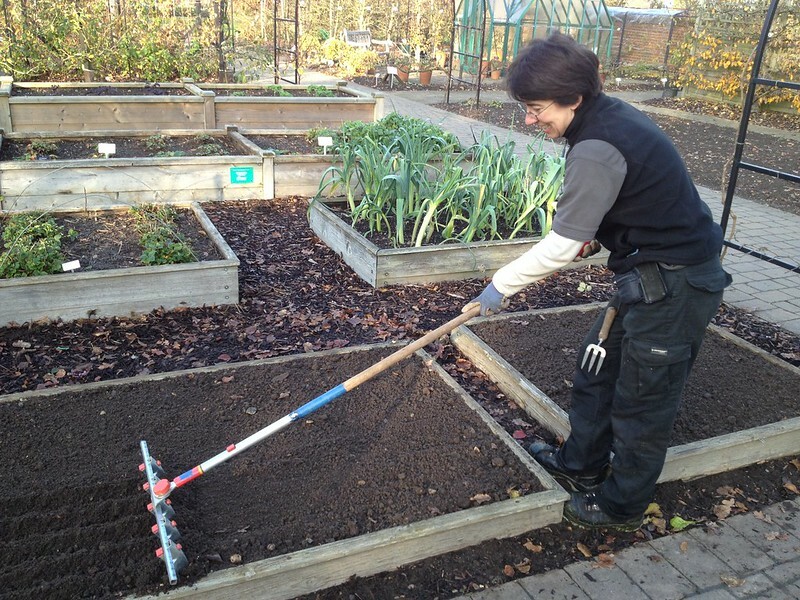 The row maker is like a rake with ruler markings and adjustable tines, so that you can space rows evenly, and draw a grid on the soil before you start planting - you can plant where the rows meet, or in the space between the rows. A convenient tool for extensive formal planting, or when you need accuracy in spacing rows, like in plant trials. As my dissertation for this year's traineeship will be on orchards, my colleagues suggested I attend the Three Counties Orchard Conference with them, and a very interesting day it was as a range of stakeholders in top fruit production, from conservation to commercial, presented to us. Sarah-Jayne Dunsby, recent graduate of the Royal Agricultural University, presented briefly her academic research on the "Future of Top Fruit Industry in the West Midlands", mentioning a issue I have heard from several other young farmers before: succession planning. She also mentioned that availability of (seasonal) labour is getting scarcer, a concern expressed by other speakers as well. A commercial producer, Michael Bentley of Castle Fruit Farms, introduced us to his recently created orchard where he grows trees for maximum efficiency by growing trees with double leaders, in order to maximise cropping and minimise labour (which takes up 2/3 of his costs - fuel electricity and fertiliser only adding up to 3% but pesticides costs running into the 20k/yr). For the last 3 reasons above he manages headlands. Someone from the participants asked him whether, given his is an intensively managed orchard, he could not leave the odd tree to senesce as wildlife habitat, but apparently it would not be commercially feasible. The accepted practice is to rip out any dead tree, as they would cast shade (and light is a limiting factor to growth in the UK, in fact he can only grow his trees to 3 m high instead of the 4 m that are customary on the Continent) and reduce productivity: it costs 20-25k GBP to plant an orchard to last 15 yrs within which it has to yield a profit. We then got to hear from Dave Kaspar of Day's Cottage Farm, who restored with his partner the traditional orchard on their family farm under a no-spray, no artificial fertiliser system: 100 acres with widely spaced trees on a ridge & furrow land that creates a suitable microclimate. The trees are set in permanent pasture and the business produces juice, cider and perry, besides running the orchard as a skills centre. With the great enthusiasm of the trainer and evangelist, Dave pointed out that traditional orchards were planted by hard-nosed farmers, not just for the environmental reasons we value them today, so restoring and operating them should come with a profit, and it does for them. Last year they managed to sell fruit for 7 months of the year, but they are also training the community to accept the fact that fruit - like all agricultural products - is naturally not there all year round. And he finds his orchard is "fantastically biodiverse" (9 species of bat, 30 species of birds, 70 species of plant and 120 species of insects in his uninproved grassland) and that beekeepers are keen to take hives to his land because of the no-spray regime that is best for bees. Some funding he receives from Countryside Stewardship and Natural England schemes, and he got a grant from the Gloucestershire Environment Trust. A modern orchard contains about 4000 trees/ha and new varieties are yielding up to 70 tonnes/ha! I cannot quite picture such huge numbers in my mind: is that how people think of orchards? But what really struck me is the amount of work that is placed in sensory and appearance research to decide which cultivars will be popular and on finding the right name to market them successfully... isn't it a curious world where only the apples with the right balance of colours on their skin get eaten? The current fad seems to be bi-colour and vibrant; green is off, being associated with acidity and so is yellow, thought to indicate over-ripeness! Investment at the moment is stifled by concerns about recouping it on the market, and Russia has been a major importer, so when it closed to imports the market became really unbalanced. The market for apples and pears in the UK (dessert, culinary, cider etc) is just over 700,000 tonnes - I have tried to double check that on the Government's Basic Horticultural Statistics but groupings of fruit are not entirely clear; in any case, we import about 2/3 of the apples we use (although there seem to be some support by the "multiples" for British products, that can fetch a 25% premium). As this week I need to research apple cultivars for our Crop of the Week exercise, I have summarised below the considerations made about common and future cultivars as they were mentioned (together with some research I did myself for the homegrown market). Good taste and flavour, free of defects and russeting, skin colour vibrant, rapid fruit production (within 5 yrs), fruit size (not too big) and consistency (80% at least of the fruit being class 1) at higher yields (up to 70 tonnes/ha); replace imports, new early varieties and sell later ones even later (i.e. 'Cameo' has potential). 'Sweet Sensation' new cultivar being tested; 'Opal' to get into the 'Golden Delicious' market. 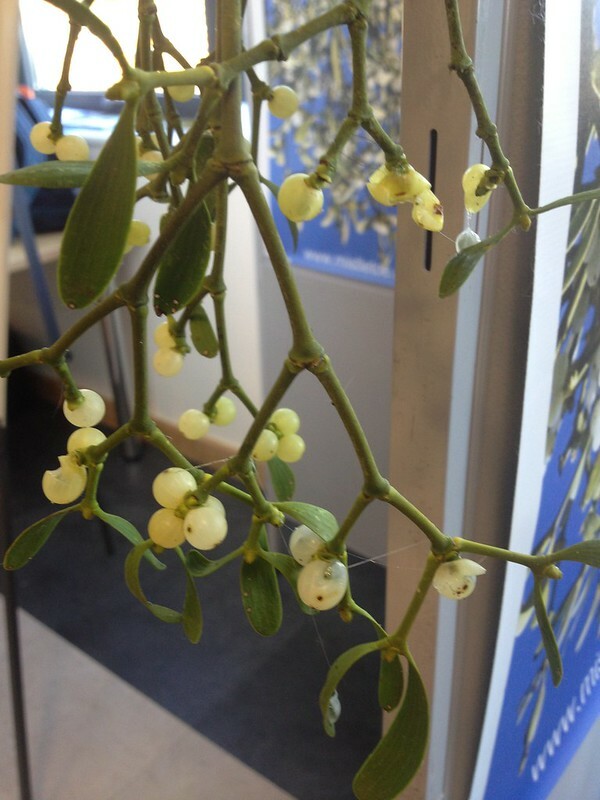 There were some stalls in the margins of the conference; the most interesting one for me was one about mistletoe (Viscum album). Is it a welcome niche habitat or a threat to orchards? An opportunity for a side crop or a threat for the main one? It is endemic in the Three Counties and there is a project trying to find out. 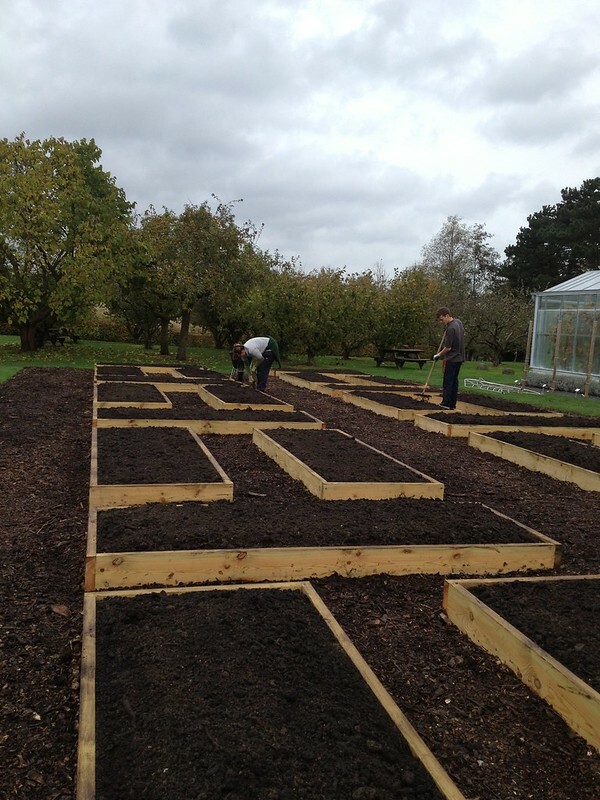 As part of the continuous improvement and renovation of the Fruit Gardens, the strawberry area beside the fruit stock beds has been transformed, and new permanent raised beds have replaced the metal benches and compost bags. I have helped in this development over the last couple of monhts. 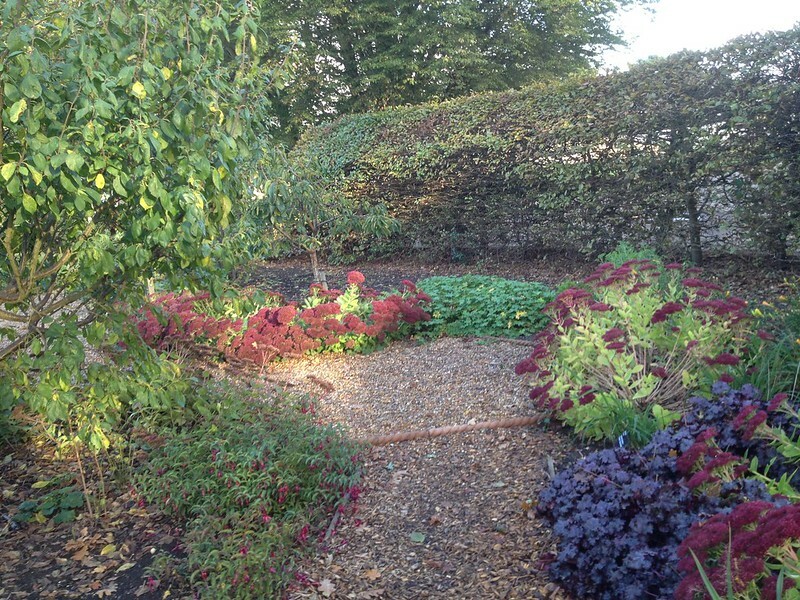 The design was agreed before my arrival, and the beds were put in place for us, but we had to do the clearing of the area and filling of the beds. 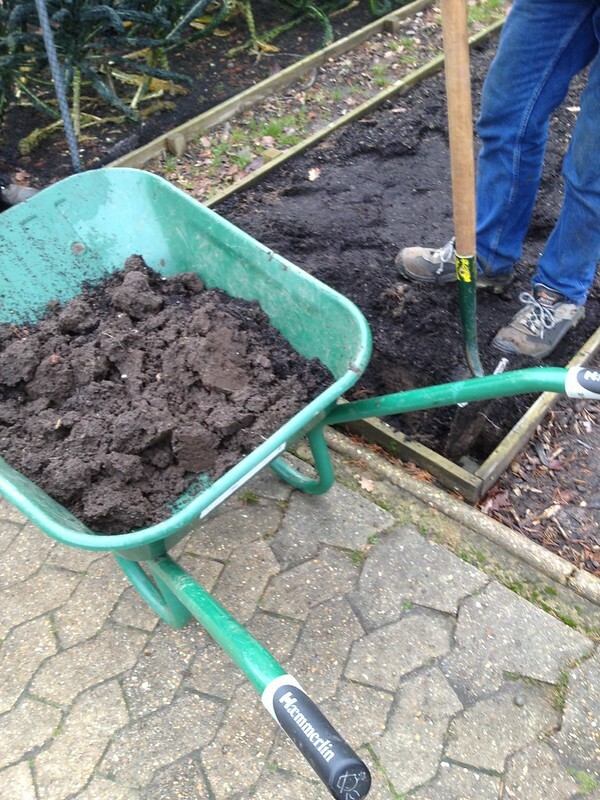 We removed, first of all, all the compost bags and spent crops, followed by the frames. 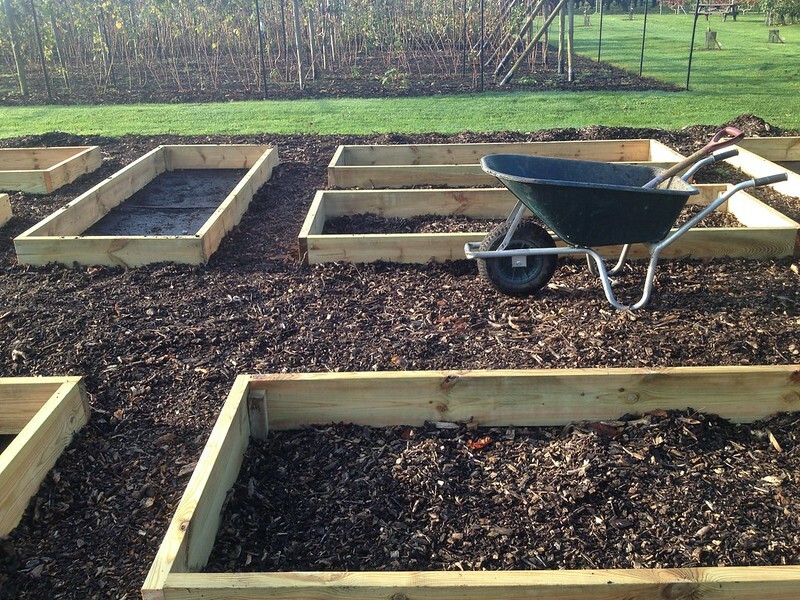 Once the beds were in place, we cleared the woodchips from the bottom, filled them with topsoil (two large lorries of it! ), which was then left to settle for a while. 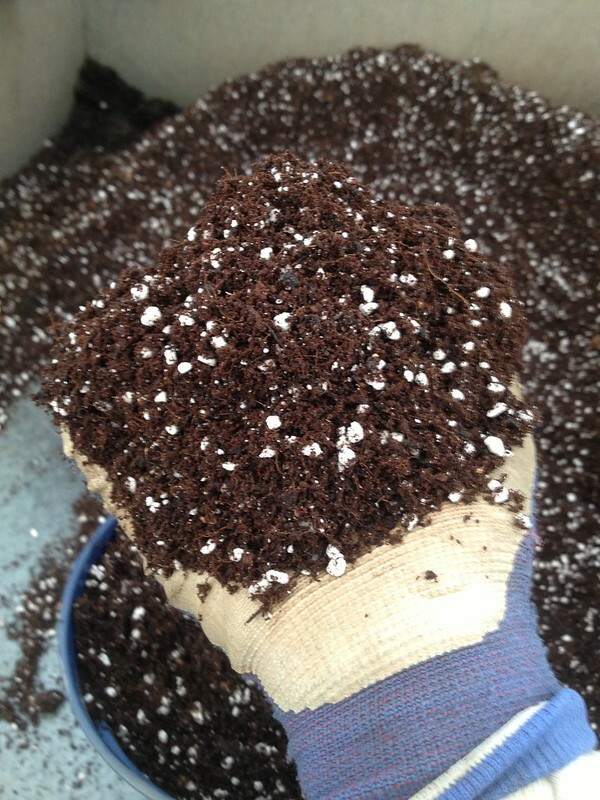 Finally, we mixed in some compost that we produce from our garden waste. As the operation was spread over time, I can only make a rough guess: 8-9 FTE were required to complete this new area. 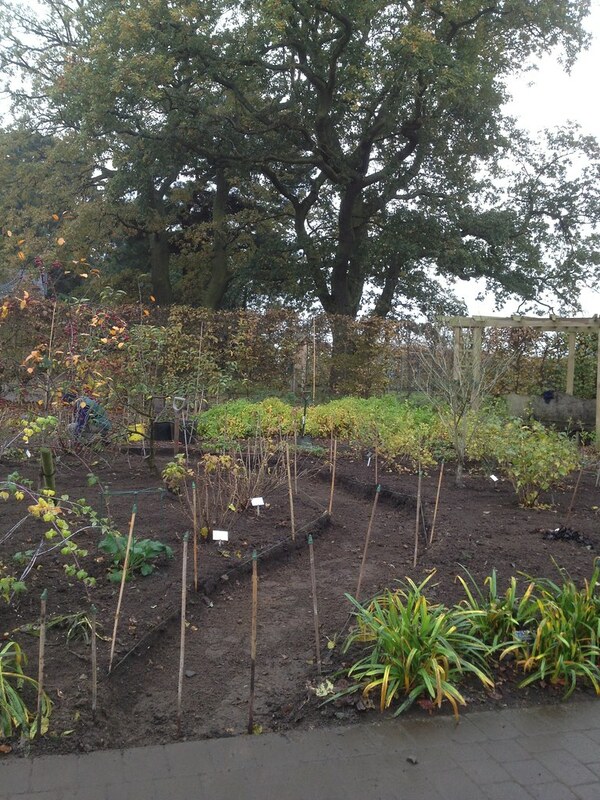 But when we finished today, it look very good and tidy, such an improvement on the previous arrangement. 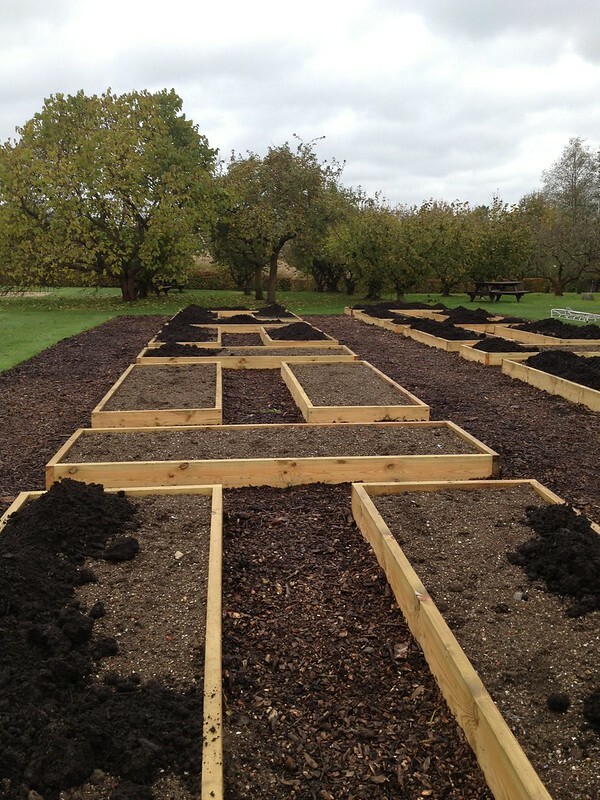 I have often wondered which is the best structure for raised beds, and I like these, they look sturdy, so I want to take inspiration formy own on the plot. 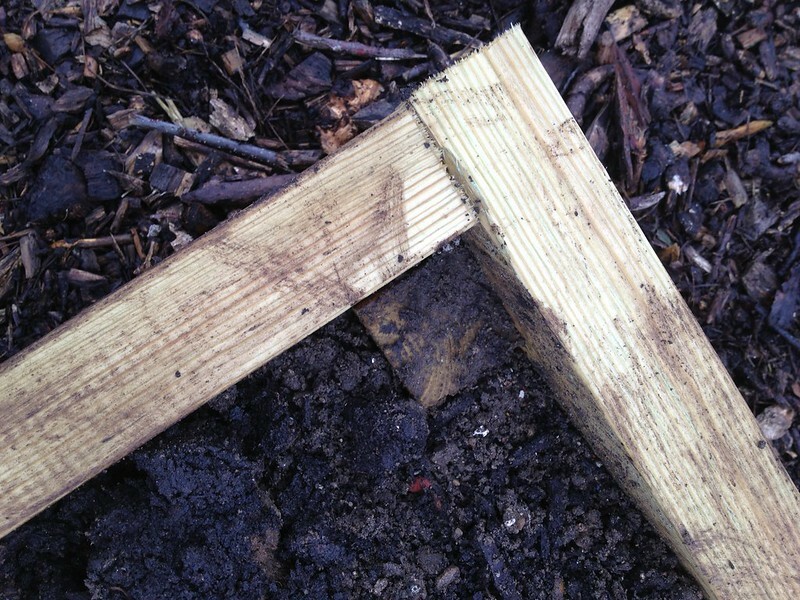 The wooden planks are fixed around four posts in the corner, which were driven through the plastic membrane. Now waiting for the spring to plant the strawberries! When you design a new planting area, it is a good idea to consider watering in some detail, possibly consulting an expert. 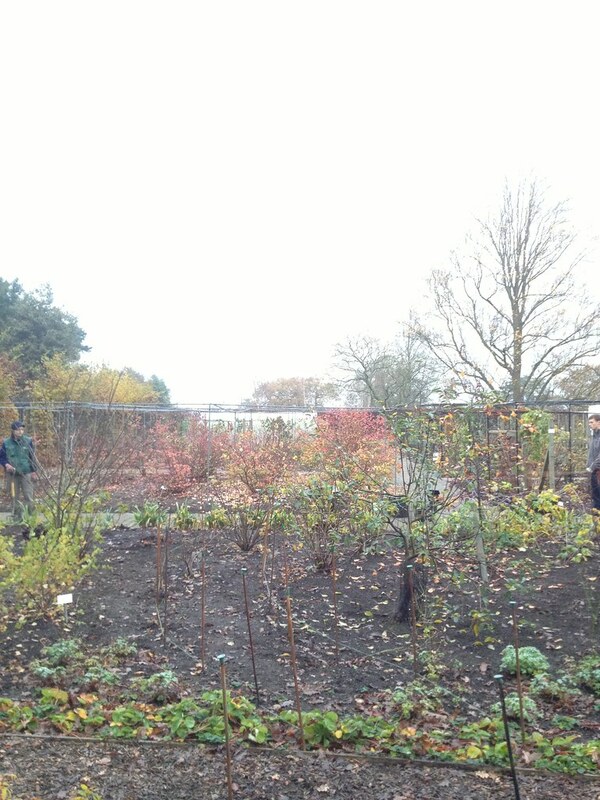 The strawberry beds were supposed to be watered with driplines, on the soil surface, and a plan was in place. 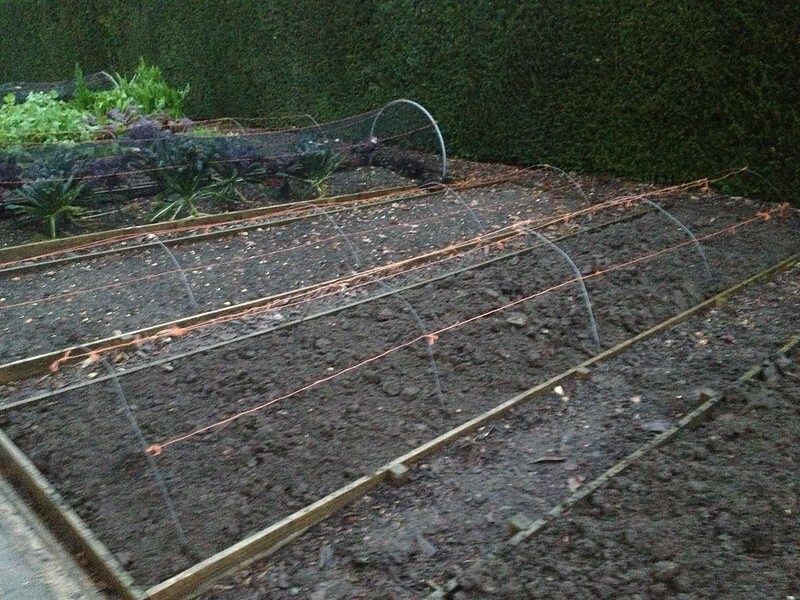 However, come the spring, and ready to put the strawberries in, the plan had to be revised for health and safety reasons: the dripline was considered a trip hazard because the paths between the beds are relatively small. 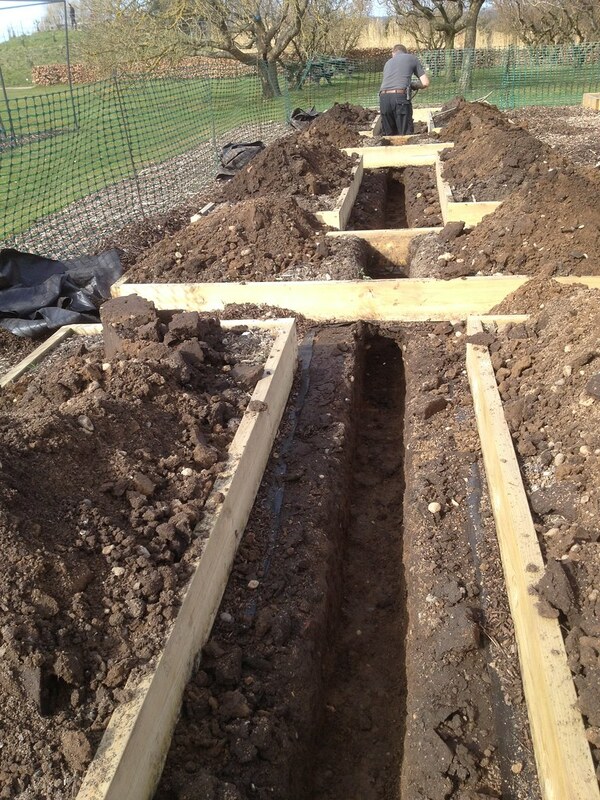 So it was decided that the driplines would be connected to the mains through underground piping and we had to spend 1.5 FTE digging trenches to bury the pipes in. 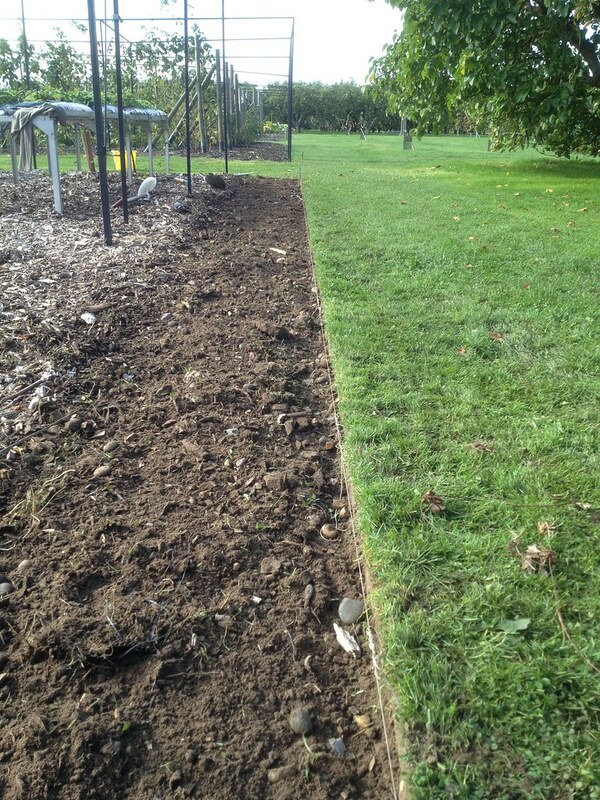 To be honest, it was quite quick and a less daunting task than it looked to start with, but doing this ahead of laying the beds, would have been more efficient with the help of a digger. In any case it was extremely interesting for me to take part in this exercise, as I had never worked with watering before, and we had the opportunity to question the irrigation specialist. 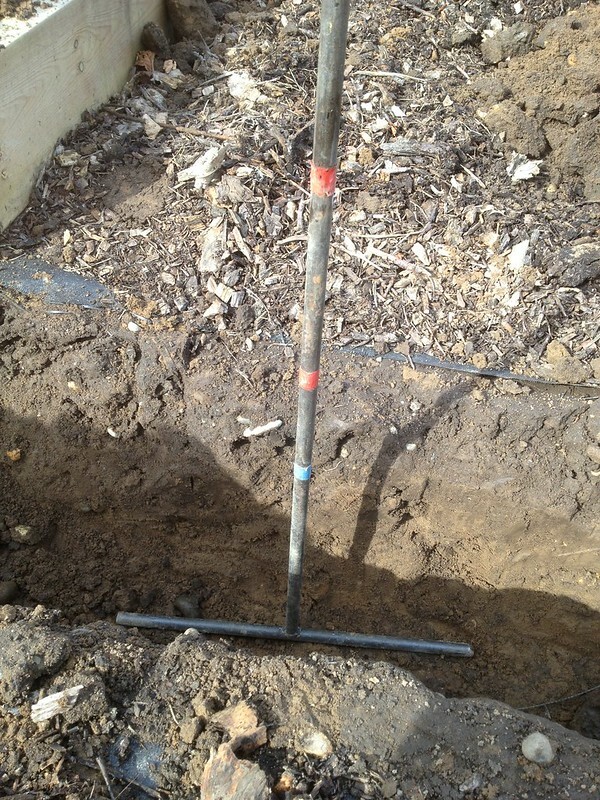 32 mm pipes would be buried at a 40 cm depth (measured with a gage), in a H shape in between the beds, so that each could have its own dripline connector. If the pipes had been mains, they would have been buried at 60 cm to avoid freezing over, or accidental damage from digging. 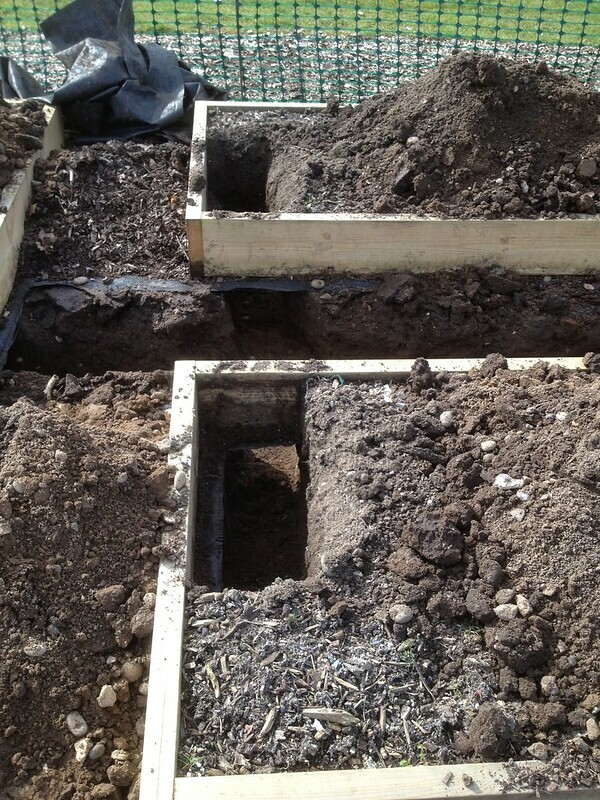 But because this is a secondary connection, and the beds are raised, so no digging is planned, it was possible to keep the pipes more shallow. 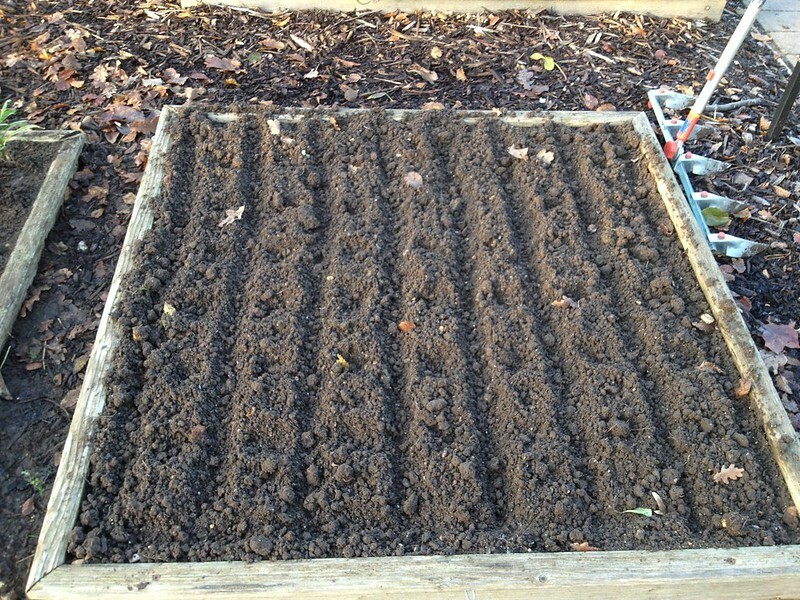 The beds will be planted with two rows of 8 strawberries each, a cultivar per row; cropping should start this year and pick next year. 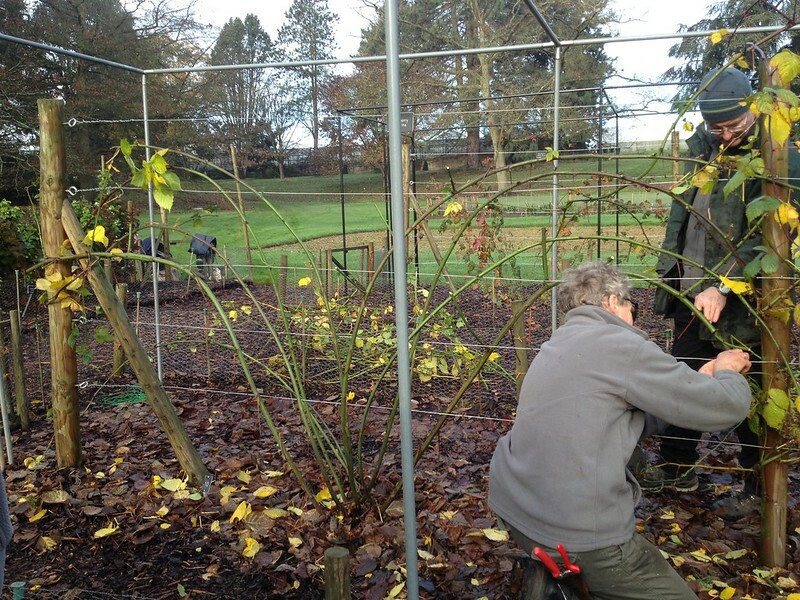 It is forecasted that plants will be replaced every other year (depending how the cultivars perform) with stock grown on site, in the nursery, from specially devoted plants. 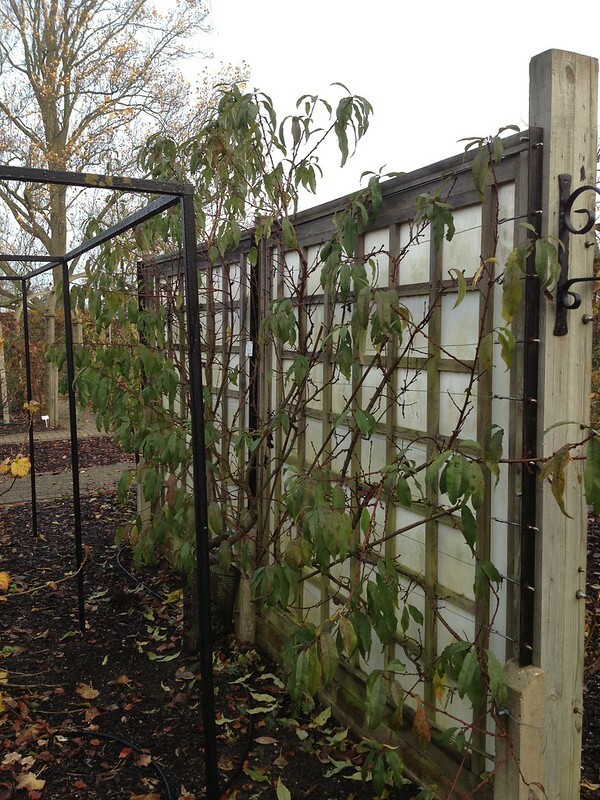 These will not be allowed to flower or fruit, so that the energy of the plant goes into producing sturdier runners. 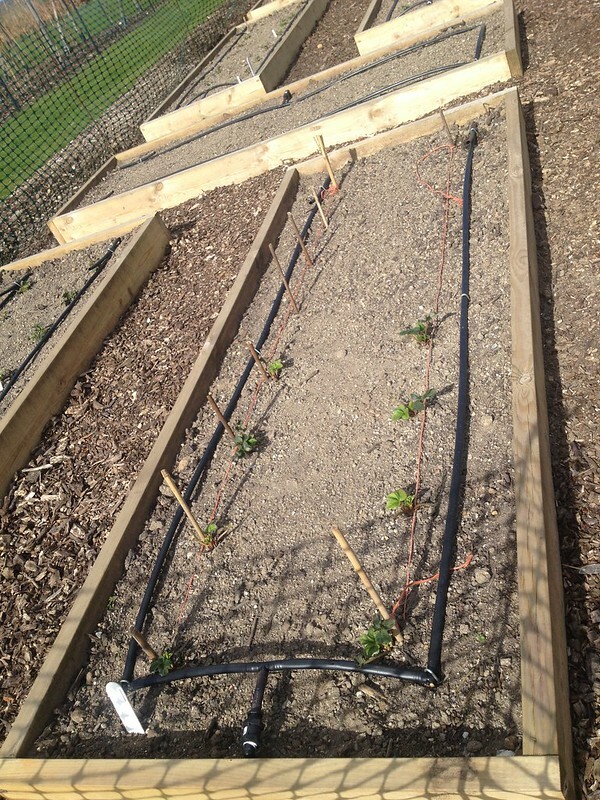 And as of the 1st of April, the irrigation is in and so are some strawberries!